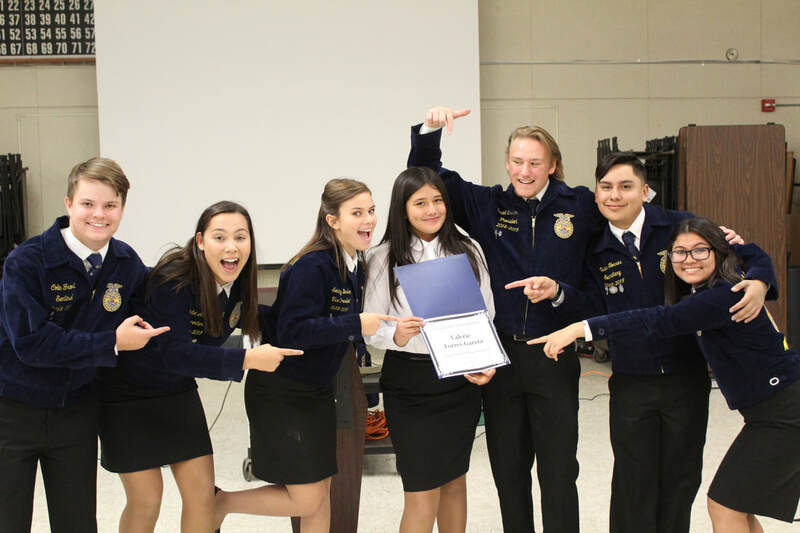 Merced FFA strongly promotes public speaking and provides many opportunities for our students to gain public speaking skills that they can use throughout their lives in the future. Public speaking contest practices will start in November. Students will compete at a local competition at Merced High School in February, competeing against other Merced FFA members. Those finalists will then move onto Super Saturday, a contest held at Merced College in February to compete against other FFA members of the 13 chapters within our section. Students can then be selected to move onto regional and state public speaking contests. Practices are everyday after school in the Ag. Department! This contests is for Greenhands only. Students will memorize and comprehend the FFA Creed extensively. The contest begins with reciting the creed followed by questions about the Creed. Students compile a binder of information on various ag. related topics. You must write an essay in a given amount of time during the contest based on the information you've compiled and present it. Designed for sophomore members, and similar to the Extemporaneous contest, students must compile a binder of information on various ag. related topics. They must write an essay in a given amount of time during the contest and present that essay to a set of judges. Students compile a resume, cover letter, and job application and participate in a mock interview for an job in the agricultural industry. In this contest, students write a 6-minute speech on any agricultural issue and answer questions based on this topic.